While Eilon Engineering’s Ron StageMaster load cells have been providing an added layer of safety protection on Cirque du Soleil shows for years, safety isn’t the only benefit of the load monitoring system as a host of other advantages are being realized as well. Cirque du Soleil has been thrilling fans for decades whether it’s under the big top in Montreal, in an arena around the world, or on one of their many resident shows. Cirque du Soleil shows aren’t your typical entertainment show however. With a reputation for delivering big production value with acrobats and other high flying acts an integral part of the performance, the forces on the rigging and structure can be complex. 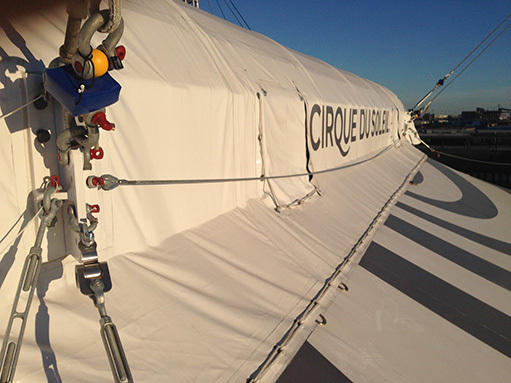 Cirque du Soleil’s signature striped big top tent, the grand chapiteau with its four masts, central cupola and heavy canvas covering, takes days to construct. Surprisingly, prior to 2007 they had never had reliable hard data on the loads and tension when it is lifted and hung. That changed when Fred Caron, Cirque du Soleil’s Senior Advisor for Acrobatic and Rigging equipment, and Jeff Lucas, Cirque du Soleil Senior Arena Rigging Specialist, addressed the need for more reliable load information in order to make setup and show planning more efficient. Historically, Cirque du Soleil has used analog dynamometers on big top shows for measuring loads and making sure tensions are what they should be. 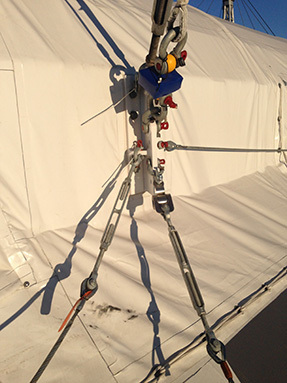 In 2007, the company turned to using Eilon Engineering load cells on the Varekai big top show and has continued the practice with their latest big top show, Volta, where they use Ron StageMaster 6000  G4 wireless load cells (12.5 ton). In February 2017, they installed eight of the Ron StageMaster 6000 load cells on the big top when it was lifted and hung, which allowed them to monitor the transfer of load and guarantee that the split between the lifting cable and the suspension cable was equal. “Everything suspended in the big top, including the production equipment, ultimately goes to the masts so the load cells are monitoring all the loads, not just for the setup but also during the show run,” Caron says. “Every time you create a show the creation team will produce a sheet stating what they think the measurements will be. Now with Volta, we can validate the numbers and compare the expected numbers with the actual numbers.” Caron adds that before using the Ron StageMaster load cells the suspension and leveling of the cupola would typically take 40 minutes to an hour. Using the load cells for real-time monitoring, where they can react and make changes right away, it now takes about 15 minutes. The Ron StageMaster load cell system on Volta communicates wirelessly to an iPad using portable radio receivers. The system produces an analytical "snapshot" of the load to ensure that it is suspended safely and allows for simultaneous real-time monitoring on one screen of hundreds of individual hanging points, groups or the entire structure. The Ron StageMaster software also allows for overlay of the load map right onto the plot on screen, enabling the rigger to immediately identify the location of an overload and take swift preventative action. Ron StageMaster also provides a record of the show and is compatible with smart phones and tablets and can even send SMS alerts. The Ron StageMaster system has a transmission distance option of up to 1000 yards (1 km) and can continuously monitor a rig 24/7/365 up to 5000 hours. It contains absolutely no standby or sleep modes, which are risky and unacceptable from a safety perspective. Up to 75 load cells can be monitored and controlled per portable receiver with up to 200 load cells per base station possible using the Central Radio Receiver. Volta can be controlled and monitored accurately in all its phases, from setup through to the last show. The system can even monitor some of the dynamic movement of artists that occurs during performances. Made of aerospace quality, high-strength alloy steel, the Ron StageMaster 6000 G4 load cell, like all Eilon Engineering load cells, is fatigue rated to withstand unlimited load cycles without the risk of failure or damage to the steel. The Ron StageMaster system is being put to the test on the Volta show in Montreal, where they will be exposed to all types of weather from February’s cold through the heat of summer. That won’t be a problem as they are designed for use in any type of weather. Volta is currently playing under a big top in the Old Port of Montreal through July 23rd then runs in Gatineau near Ottawa from August 3rd to the 27th and at Toronto’s Port Lands from September 7th to October 29th.